Chino is a girl whose dream job is to become an amazing barista of Rabbit House. Chino, being reserved and quiet, found it difficult at first to open up to Cocoa when she first moved over to Rabbit House and being the energetic girl Cocoa is, she often tried acting as the bigger sister of Chino. Chino has an extremely low tolerance for alcohol and will turn into a cute little sister character when she even smells even alcohol from chocolate and is the type to remember everything she did after she is no longer intoxicated. 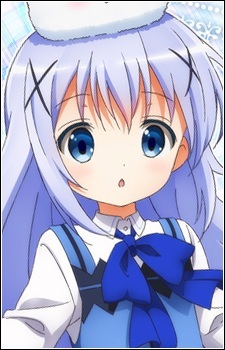 Chino looks up to Syaro, Rize, Cocoa, Chiya, and Mocoa as they are older and they act as role models for her. Her two friends of age are Maya and Megu.